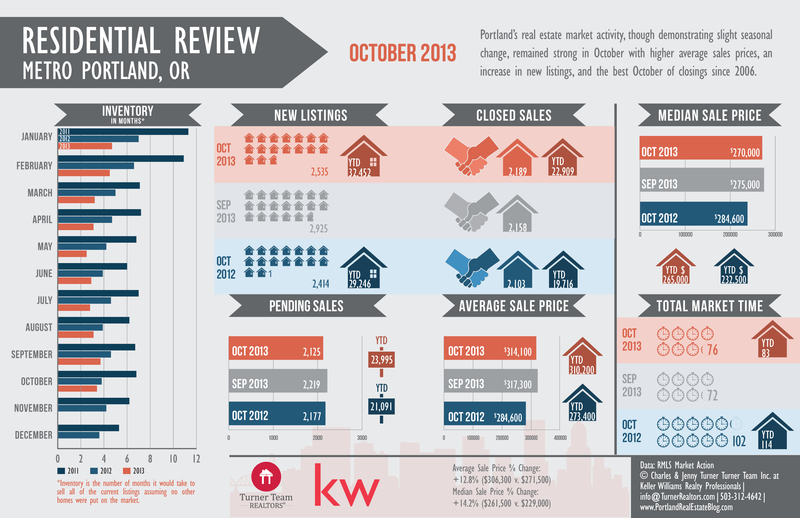 Info-graphic of the Portland Metro Real Estate Market Activity created by the Turner Team using local data collected by the RMLS Market Action publication. First quarter 2013: slightly soft. OVERVIEW: The economic recovery, which began in the second quarter of 2011, is gaining momentum in the Northwest region and outperforming the nationwide recovery. Year-over-year, second quarter 2013 job growth in the region was 1.7 percent compared with growth of 1.5 percent a year earlier and the U.S. rate of 1.6 percent. The 7.0 percent average unemployment rate for the region was less than the 7.4 percent national rate during the second quarter of 2013. Sales housing market conditions in the region improved for the eighth consecutive quarter and are currently balanced compared with the soft conditions recorded a year ago. Demand for rental units is strong in the region, where average apartment vacancy rates declined and average rents increased between 2 and 6 percent in selected major metropolitan areas. â€¢ The economic recovery is broad based, and job growth occurred in every private employment sector.